Surely you’ve heard of the famous “kamikaze” from the Second World War. Well, this is how it’s written! 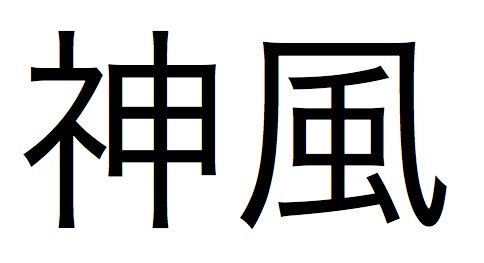 Separating the two characters, the first one means God (かみ, kami). It is an aggregation of the two parts 示 and 申, which represent an altar, and the lightning or thunder descending from the sky. The second character, as I introduced to you in the windstorm lesson, means wind. So, kamikaze means “God wind” or “divine wind“. As you already know, kamikaze refers to special units carrying out suicide attacks by crashing the pilot-guided missiles onto enemy targets. However, did you know this is not the original meaning? In fact, in 1274 and 1281, the term was used to describe two major typhoons that are said to have saved Japan from two Mongol fleets by dispersing the invasions! Video Games: Jubeat, the Japanese Guitar Hero!